Good morning! Are you counting the days to Valentine's Day? It's fast approaching! What's on the menu for Valentine's Day breakfast at your house? If you want easy, you could pour strawberry milk over corn flakes. You could toast up a cherry Pop-tart. You could make toast, spread with strawberry jam and make cut-outs with a heart-shaped cookie cutter. Or . . . . . . .
Are you looking for an easy, fun, kid-friendly, and budget-wise breakfast for this Valentine's Day? 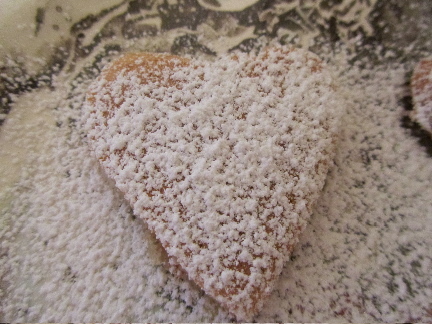 Here's what I make for Valentine's breakfast most years. 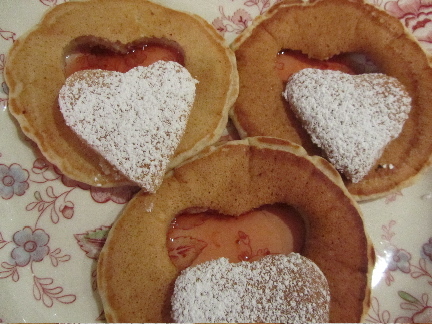 Pancake hearts!! All you need is pancake batter, a griddle or skillet, large spoon (I use the serving spoon that came with our cutlery) and metal spatula. 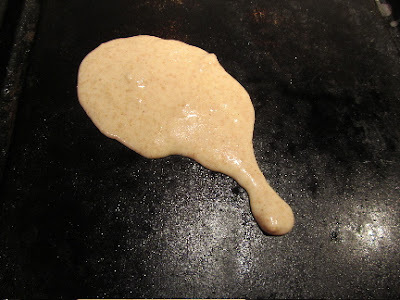 Make your pancake batter a bit on the thin side, so that it pours well from the spoon. I like to add a teaspoon of vanilla extract to the batter. 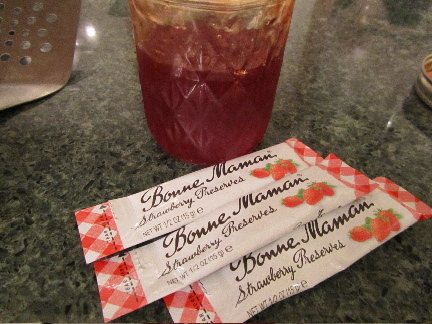 The vanilla cake is nice with the fruit syrup. Fill your large spoon with batter. Think of the heart as two halves. 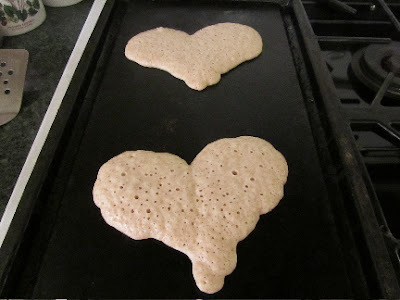 On the first halve, begin dropping the batter from the tip of the spoon, as you would a regular pancake, making the rounded portion of the heart half. Don't use all the batter in your spoon, save about 1/4. 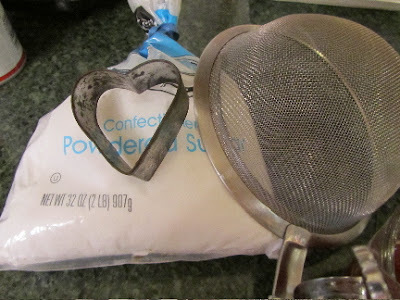 Now, with the tip of the spoon, draw the batter down to the pointed part of the heart. 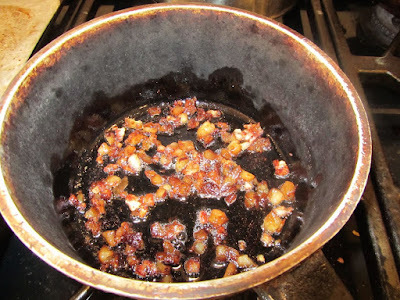 Quickly refill your spoon, and begin the other half of the heart, fairly close to the first half, so the two halves will join to make one heart. Finish up the point, joining the two points. That's the heart! 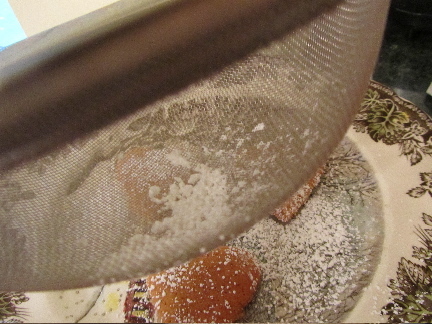 Use the last bit of batter in the spoon to fix any edges that didn't fill out properly. These don't need to be perfect, because a lot will be hidden by the whipped cream. When the pancakes' bubbles have mostly popped, flip them over. Place one or two pancakes on a plate. 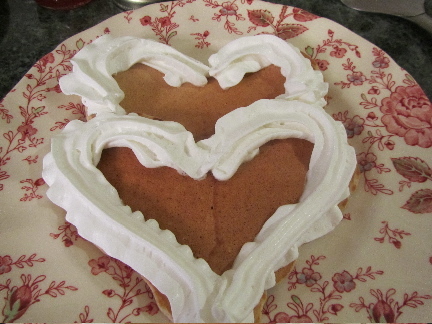 Pipe whipped cream (I use spray whip cream) around the edges, following the heart shape. Spoon syrup inside the whip cream border. Voila! 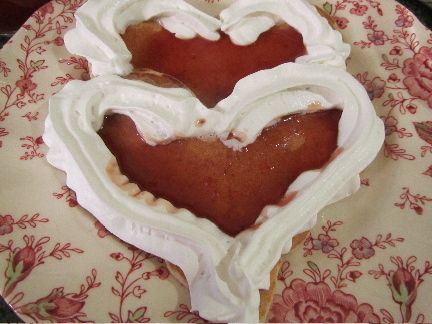 Valentine's Day pancakes. These pancakes can be made the afternoon before, and reheated in the morning. When Valentine's Day falls on a school day, I make them the afternoon of the 13th, then reheat in the morning. 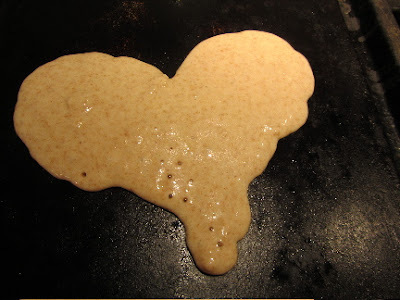 Just not sure about making heart-shaped pancakes? Not a problem. 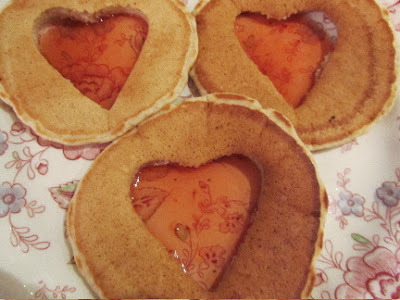 Here's one other way to make Valentine's pancakes. 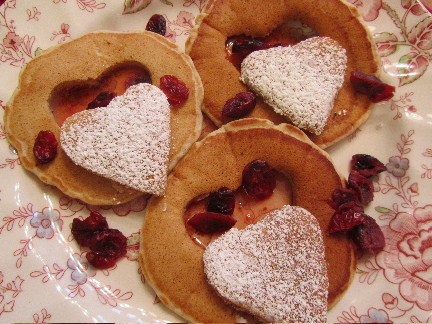 You'll need round pancakes, a heart-shaped cookie cutter, a pink jelly/jam syrup, as above, powdered sugar, sifter and dried cranberries. Make your regular round pancakes. 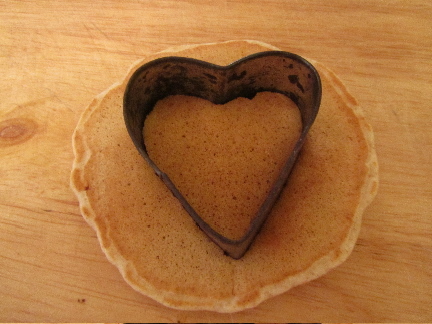 After cooking, use a heart-shaped cookie cutter to cut a heart out of the center of each pancake. This works best on a wood cutting board. 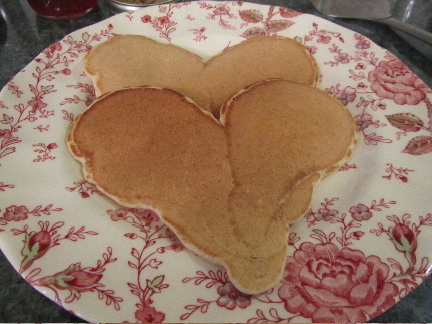 On each plate, place 2 or 3 round pancakes with the heart cut out. Fill the empty heart with red jelly or jam. It's okay if the jelly/jam bleeds underneath the pancakes. It won't be visible. Take the heart cut-outs, place on another plate and sprinkle with powdered sugar. Place the cut-outs on the plate along with the round pancakes. Sprinkle with some dried cranberries. Okay, so a little bit of fuss for Valentine's Day. But it's fun to do, and these treats for the family are my gift to them. 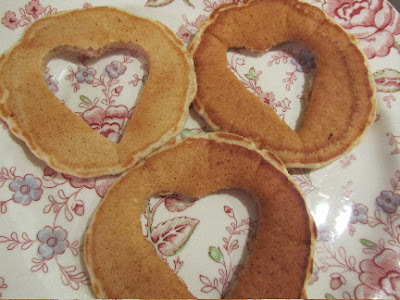 These pancakes are an easy way to do something nice for your family on Valentines Day. But to tell you the truth, I'm not sure the males in my family would notice that they were heart shaped. They would however, be thrilled that we were having pancakes. Chasing the sun? Now I'm intrigued. Catch some rays for the rest of us. It is sunny, but cold. But i'll take it! Hope all is well at your end of the continent. Did the huge storm hit your area, too? I'll do my best to send some sun your way! Many of my relatives were in the middle of a couple of feet of snow, but only had flurries. Hope you're having a great time. Have a fun trip. I long for spring, it can't be far off can it? I am so ready to get back out into the garden again. My crocus are up, no blooms yet, but just seeing the green blades gives me hope that spring is not far! Do you have bulbs planted for spring bloom? 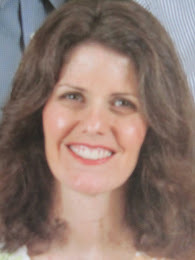 I hope you had a wonderful Valentine's Day, whether you celebrated before or after work! I haven't made buckwheat pancakes in a while. I'll have to do those again soon. Thanks for reminding me about them. 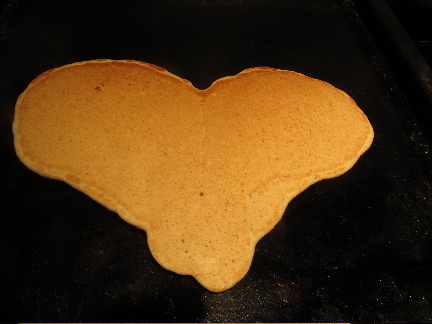 Tomorrow, Feb 12, is "Shrove Tuesday" or Pancake Day, so we are having pancakes for dinner! I learn something new everyday. I didn't know that Shrove Tuesday was celebrated in part by eating pancakes. I had to look that up. It seems to be much like Mardi Gras (Fat Tuesday), eating rich foods before lent begins. I hope your pancakes were delicious!